Yippee! I finished a quilt this week. This makes 3 so far this year, which has got to be a world record! (At least for me it is) Meet “Three Dimensions of Happiness” — my honeyman named it! Last October, our quilt guild decided to participate in the Riley Blake challenge sponsored by The Modern Quilt Guild. We each received 6 fat-eighths of fabric. The rules are that you could make anything, but it had to be quilted, and you could add other solids and other Riley Blake fabric. I had been working on a design for a baby quilt and decide to use the fabrics from this challenge for that. I get ideas from the strangest places — sometimes I see patterns in nature, furniture, architecture, or sometimes I dream patterns. Much to the embarrassment of my husband (hey, what are wives for? ), I often stop and take pictures of carpet, fixtures, ceiling beams, silos, or whatever catches my eye. I am loving the modern technology that allows me to have a camera in my cell phone! But, because of this, I have many more ideas than I have time to make. So one evening Iast fall, I was watching an episode of Hawaii Five-O and there was a piece of art work on the wall in one of the scenes that I loved. It was simple and modern and I thought it would make a good quilt. Once I had the center made, I thought it needed a border and dreamed that a alternating white/colored border would look good. So I just sewed some strips together, none of which were the same length, and then sewed them around without caring much where the colored pieces fell. And… I don’t love it. I think it may look better on a larger quilt, but I don’t love it here. So, I’ll likely redesign the border a bit before finalizing the pattern. I decided to quilt it in a spiral and I LUV how it looks. But, I promise you, it is more difficult than it looks — especially in the center. In fact, it just about killed me. Well, not physically, but mentally. Once I had 4-5 rounds done, it got much easier, but the center part was hard on my home machine. And it pushed the fabric a lot since I kept sewing in the same direction. I should have either pinned it more or used a spray adhesive. Next time I’ll know and it will likely be less noticeable once I wash it and everything shrinks a little. 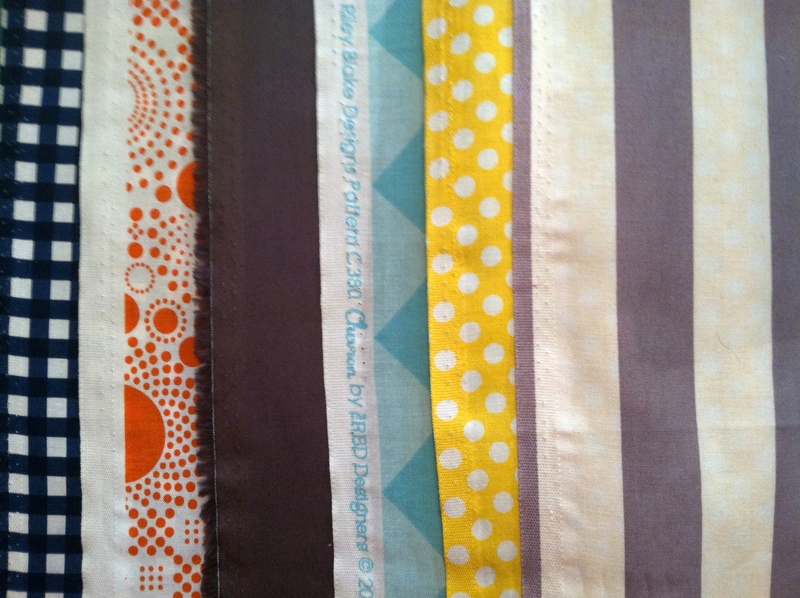 The binding is not part of the fabric that I got for the challenge, but it is a Riley Blake print called Shuffle. This entry was posted in Quilting/Sewing and tagged baby, boy, challenge, dimension, Hawaii Five-O, inspiration, quilt, quilting, Riley Blake, spiral, three by monkeyneedle. Bookmark the permalink. I like he way this quilt has turned out. Great way to use these fabrics. I actually like the scrappy border. Love the quilting, too. Wow Lynn! I really love this quilt. Well done! 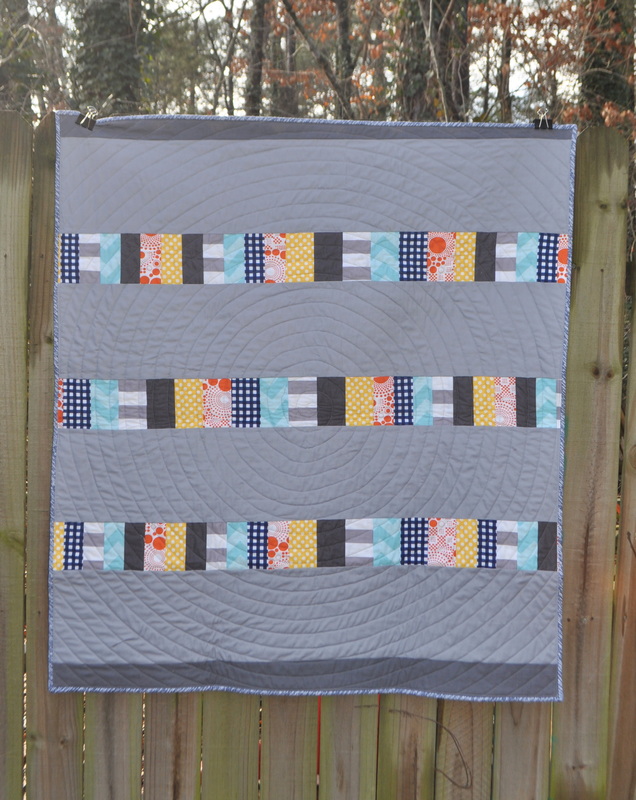 Your design is awesome and the quilting is perfect for it! I like the quilting on it. This is SO amazing! It shows off the challenge fabrics beautifully, and the spiral quilting really sets it off. Love the pattern. I really like the effect the blocks have and the circular quilting does set it off! 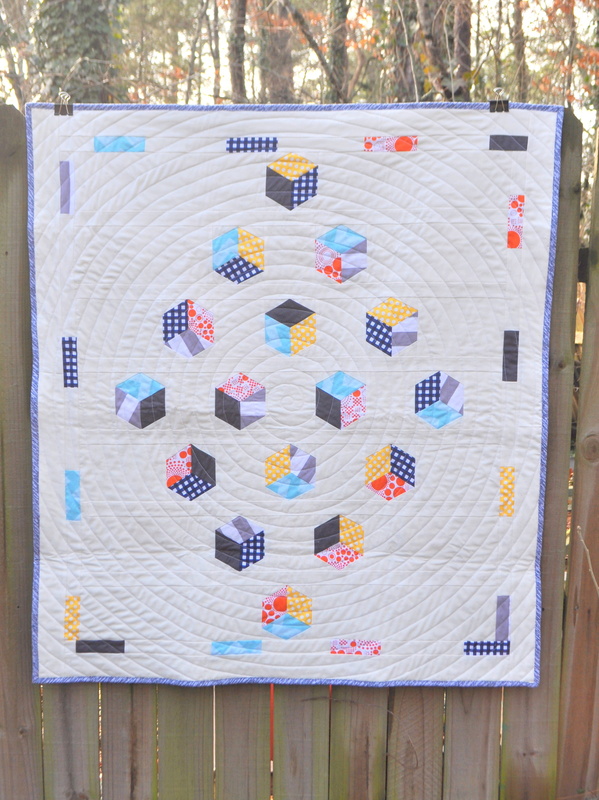 I like the floating cubes and the spiral quilting! I think it would have been even more powerful without the border though. Holy cow. I’m obsessed. I’m not exaggerating when I say this is my favorite I’ve seen. 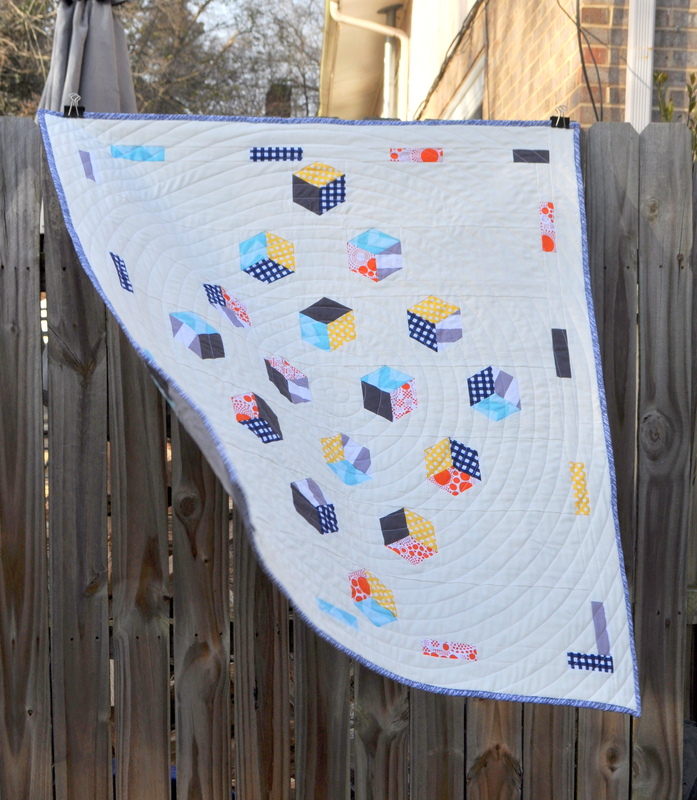 I love the movement from the quilting – it’s like they are being juggled. Loveeeeee. Your quilt is fabulous!! I just love the way the cubes are floating and moving! What a cool effect!! WOW!!!!! This turned out amazing! Love how it looks three dimensional!